San Antonio passenger and car ferry ticket prices, timetables, ticket reservations and information for ferries sailing from San Antonio to Barcellona, Denia and Valencia. Compare all available San Antonio ferry ticket prices in real time and book the cheapest available San Antonio car and passenger ferry tickets sailing to and from San Antonio, Barcellona, Denia and Valencia with Balearia or Acciona Ferry Line ferries online with instant confirmation. Book San Antonio Ferry Tickets with Balearia or Acciona Ferry Line for ferries sailing from San Antonio to Barcellona, Denia and Valencia online in advance to enjoy the cheapest available ferry ticket price. The price you see is the price you pay. There are no hidden extras or surprises such as added fuel surcharges or booking fees and we do not charge you anything extra for paying with a Visa Electron card. The price we quote you for your selected San Antonio passenger or car ferry ticket, onboard accommodation and vehicle type is all you will pay, and that's a promise. To obtain a San Antonio ferry ticket price and book your ferry ticket securely online please use the real time ferry booking form on the left. You are also able to add a hotel at your destination, or anywhere else, to your ferry ticket when completing your ferry ticket reservation. San Antonio is situated on the west coast of Ibiza, 10 miles from Ibiza Town and 14 miles from the airport. Famous for its sunsets in Café del Mar and lively night-time vibe, San Antonio is a great choice, being popular with British tourists. Holidays in San Antonio also feature a variety of small beaches on a long bay, encompassing legendary spots like the Sunset Strip at Cala Gracio as well as quieter resorts like Port des Torrent. San Antonio is also a popular with families and couples, particularly outside the main summer season and in quieter parts of the bay. There are lots of shops, cafes and bars spreading out from the pretty harbour and stretching along the palm-lined seafront promenade. There is a colourful central square and plenty of pedestrianised areas. San Antonio attract thousands of young visitors drawn by an endless choice of nightlife. Staying in San Antonio means you can also include visits to legendary clubs around Ibiza Town thanks to the night time Disco Bus. A famous feature of San Antonio is the fantastic selection of trendy relaxed street cafes and chill-out beach bars, including the famous Cafe del Mar. Watching the sunset from the Sunset Strip at Cala d’es Moro is a San Antonio holiday essential. The cafes are the centre of the pre-clubbing scene and an excellent way of finding out what is going on next! San Antonio has something for everybody, with a great variety of accommodation, entertainment, clubs, bars and restaurants. There are five great beaches within easy reach of the resort and these areas are known for calm, warm waters and have all the amenities. You can try out water sports or just take it easy and have a relaxing holiday on the beach, top up your tan and read a good book. Take a trip to San Antonio Harbour for the widest ranges of boating activities and the best way to explore Ibiza. This is a fantastic way to spend your day sailing along the coastline of Ibiza - soak up the sun and experience some outstanding views. Or amble along this historic harbour and its palm fringed promenade, well worth a visit. There is a popular play park on San Antonio Bay where you’ll find trampolines, climbing frames, bouncy castles, sand pits and swings to keep the kids amused for hours. This is a perfect place for a day off from the beach and ideal for family holiday entertainment. Paintball Lounge Party offers a remarkable paintballing adventure that is not to be missed. As the name suggests, there is much more to this venue than the brilliantly set out paintballing - In between games you can have a swim, grab a bite to eat, and a soft drink or alcoholic drink at the bar. This is great entertainment if you go alone, in a group or with the family. The Aquarium Cap Blanc provides the opportunity to see a selection of the Mediterranean’s sea life in its natural environment. The aquarium is located on the outskirts of San Antonio close to Cala Gracio, so it’s easy to get to. From San Antonio it is easy to book onto a diving course at one of the qualified diving schools in the area. Trips to over 80 dive sites including caves and wrecks are on offer almost all year round, and beginners benefit from the calmness and high visibility of the water here. Arenal Diving is one of the most professional and advanced diving centres on the West coast of Ibiza, situated towards the North of San Antonio Bay. Right at the end for San Antonio bay is the famous bar, Café Del Mar. Make sure you get there before sunset, get yourself a drink, and find yourself a place to sit and watch the sun go down. This is the bar that has launched many chill-out compilations that are world famous. So you will be in for some good music and this is a great place to start before you hit the clubs! A holiday to San Antonio shouts out, nightlife! It’s packed with clubbers looking for sun, beach relaxation and the buzzing nightlife for which Ibiza is now world renowned. The most famous clubs in San Antonio are found on sunset strip, an area with great views and a friendly, party atmosphere. Or you could head to Ibiza Town for an alternative. As well as partying, you can also enjoy some beach life in San Antonio! The best San Antonio beaches are to the south and at Cala Bou. Sheltered San Antonio beaches with safe shallow water are found to the north at Cala Gracio or west at quieter Port des Torrent. San Antonio offers plenty of water sports along with waterparks, karting, parascending, bungee jumping, tennis and horse riding. Best Price Guarantee - We always offer you our lowest available Balearia or Acciona Ferry Line passenger and car ferries ticket price to and from San Antonio. There are no hidden extras or surprises such as added fuel surcharges or booking fees and we also we do not charge you anything extra for paying with a Visa Electron card. The price we quote for your selected San Antonio ferry ticket, onboard accommodation and vehicle type is all you will pay, and that's a promise! In the unlikely event you find the same all inclusive San Antonio ferry ticket cheaper in the brochure of any other tour operator we promise that we will do our best to beat that price or offer you the choice of requesting a refund. 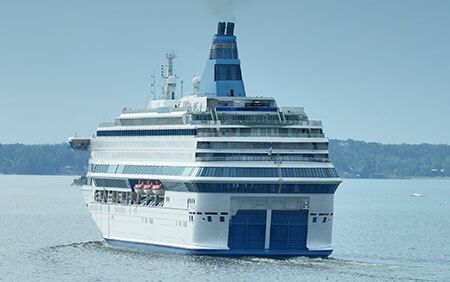 To book San Antonio car and passenger ferry tickets please click here. At FerryTO.se you are able to obtain live San Antonio ferry ticket prices, check availability and book car and passenger ferry tickets to and from San Antonio at our lowest available ticket price. Ferryto.se is part of the world's largest online ferry ticket distribution network providing the ability to book over 80 major European ferry operators including to San Antonio and to over 1,200 other ferry routes throughout the UK, France, Spain, Ireland, Holland, Eastern Europe, the Mediterranean, the Baltic and North Africa. For more information, answers to frequently asked questions or to contact us directly please click here.